Hello people! I hope you've missed me because I've been having a momentary writer's block on what to tell you aside the fact that I have gotten older (And fatter) and that I am still mulling around home. 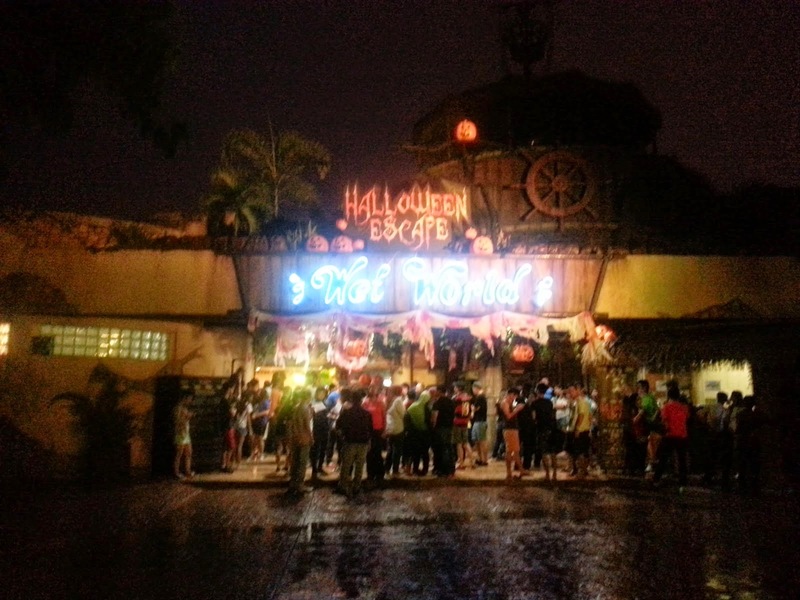 But last Saturday proved a little different for me because I got to visit Malaysia's 1st Halloween Escape happening at the Wet World, Shah Alam! 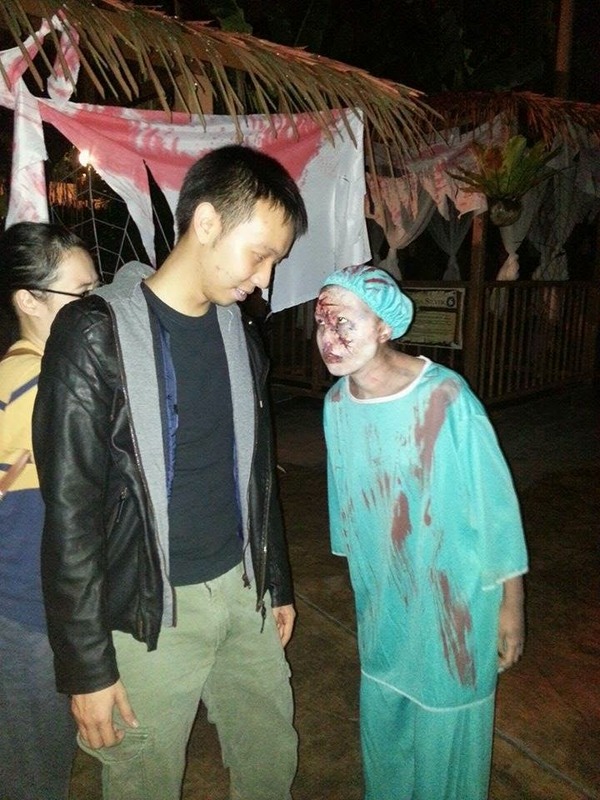 Capturing the essence of fear now that it's Halloween season, Wet World Shah Alam decided to pull in Escape Room to make up the very first Halloween Escape in Malaysia where you first get scared then you get witty. 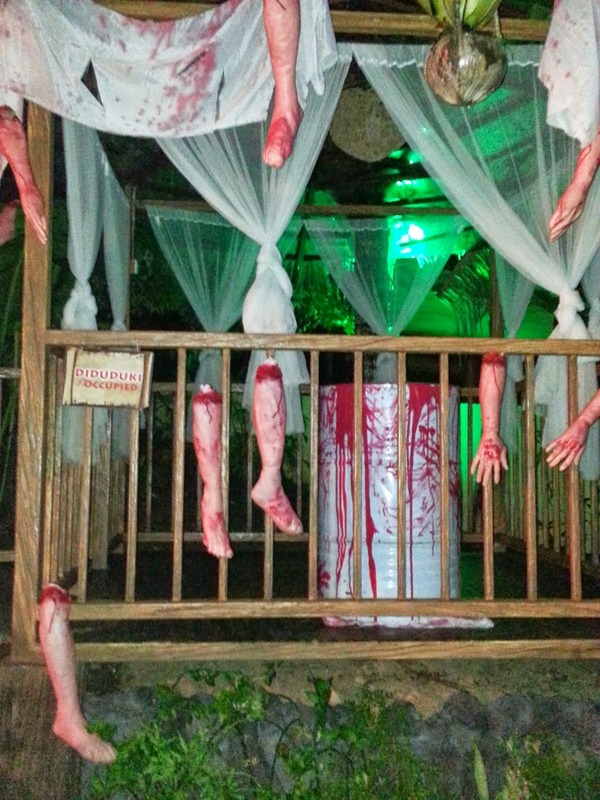 Point in fact is that there are fantastic decorations set up all over Wet World Shah Alam that will be up all of October and several Escape Room styled cabanas that are open every Fridays, Saturdays and Sundays of the entire October this year. 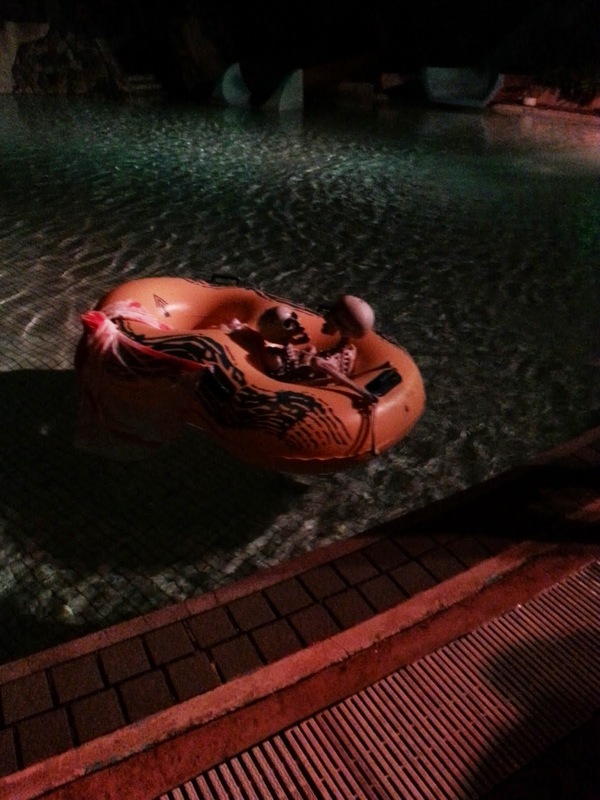 Interesting decorations of skeletons in a float just bobbing up and down the pool. As I arrived later than expected, I had missed out on the Terrifying Mist Water Show that featured water projection of these scary heads and eerie speeches set at the Wet World Lobby. Luckily for me however, they had it up and showing again around 9.30 PM and I caught half of it on camera! I hope you can hear the video because I hear it loud and clear! Say hello to their friendly...uh...ghost. Stephanie and Chan who were there much earlier even had time for a walkabout of the area while it was still bright so you could head over to their blog where you can see their account of the event right here. I suppose that's what happens when you don't do too good of a planning on itinerary and count too much on Waze. 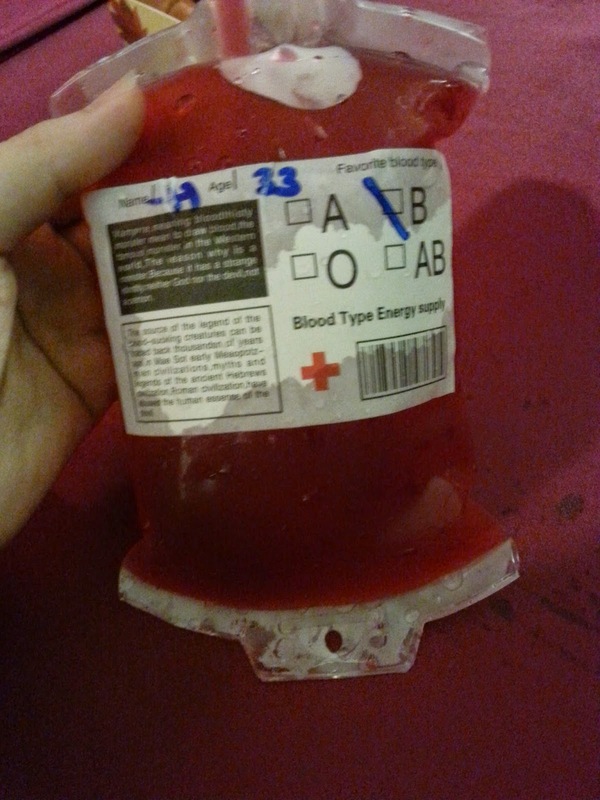 "Blood" packs for the thirsty. 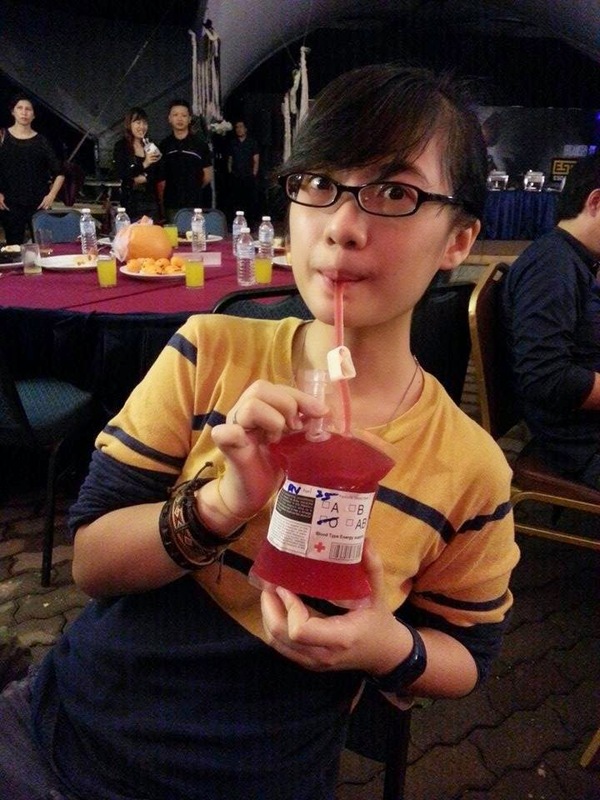 Having sips of "type O blood". I did get very thirsty all night. The thing that I enjoyed most about the entire night had to be the amount of precise details being put into it what with food that resembled fingers and syrup served in the looks of blood packs. 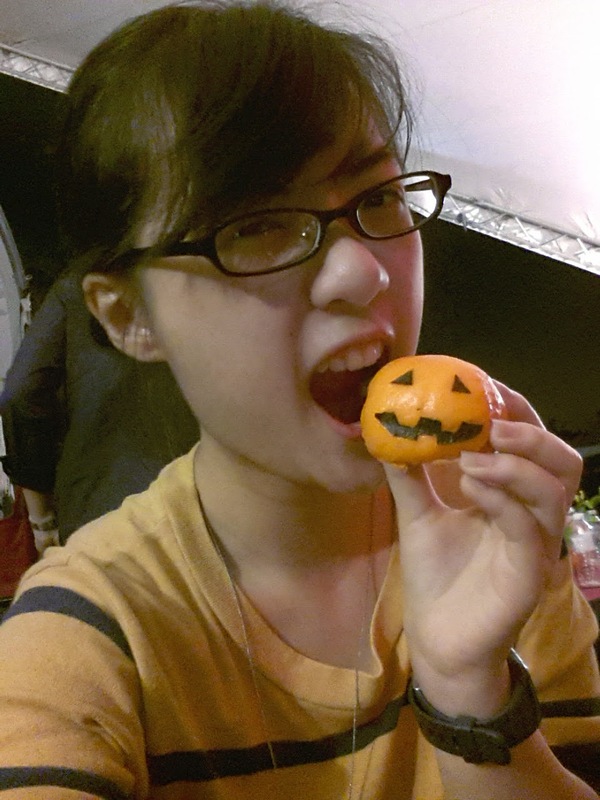 In fact, they even had this adorable pumpkin bun that I could NOT get over! I'm sorry I had to eat you, pumpkin bun! Caught in action by Steph. The thug looking person next to me is Steven, my plus one of the night. Obviously food was not the only thing that got us hooked because they had likes of Chinese vampires walking around and dead nurses in scrubs scaring the bejesus out of Stephanie all night long. She was actually so scared, she kept repeating this all night long: "I will punch them if they come near me!" It was her mantra, I think. 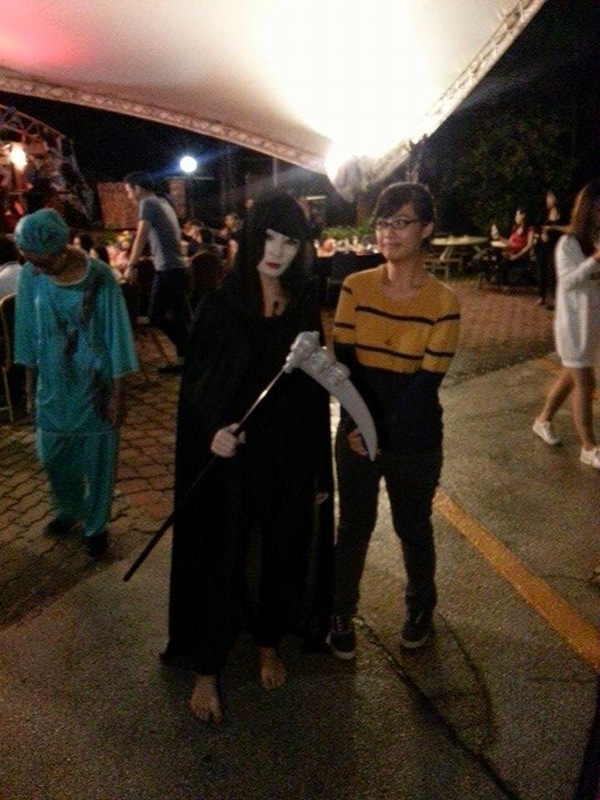 I hung out with this girl in white and a scythe...before she went "RAWR" on me. Note the nurse in scrubs on the left. She was just...epic. Come on, it's not everyday you get to hang out with ghosts...right? What we did get to try that night however, was the Haunted House that was set up by Escape Room as well as one of the 4 mini cabana escapes (Because the lines were really long), both of which we failed to find our ways out. 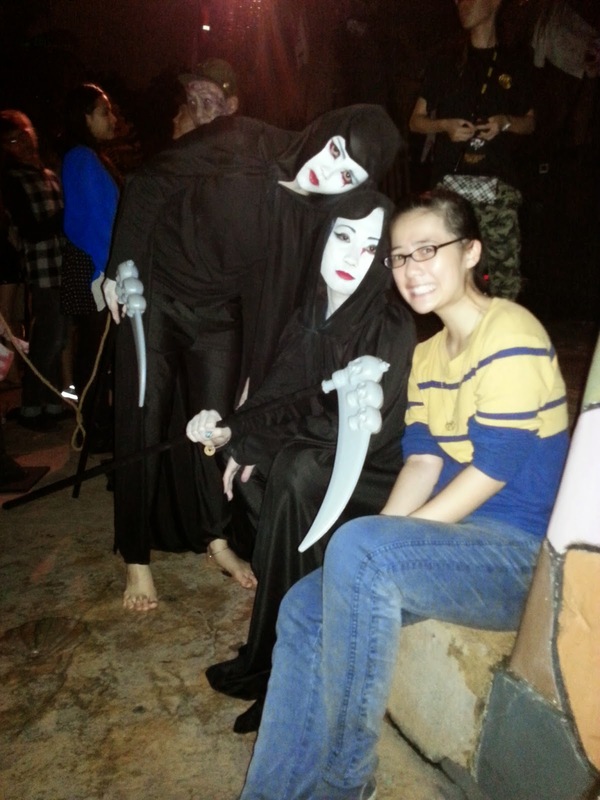 For someone who despises horror movies and scream fests, I told my heart to be still and braved my way into the Haunted House but it wasn't a feat done without my high pitched screams; a part of me that still isn't as boy-ish as most of my friends think. Steven's stare down with the nurse in scrubs. Three guesses who walked away a winner. Tip: It isn't the guy. 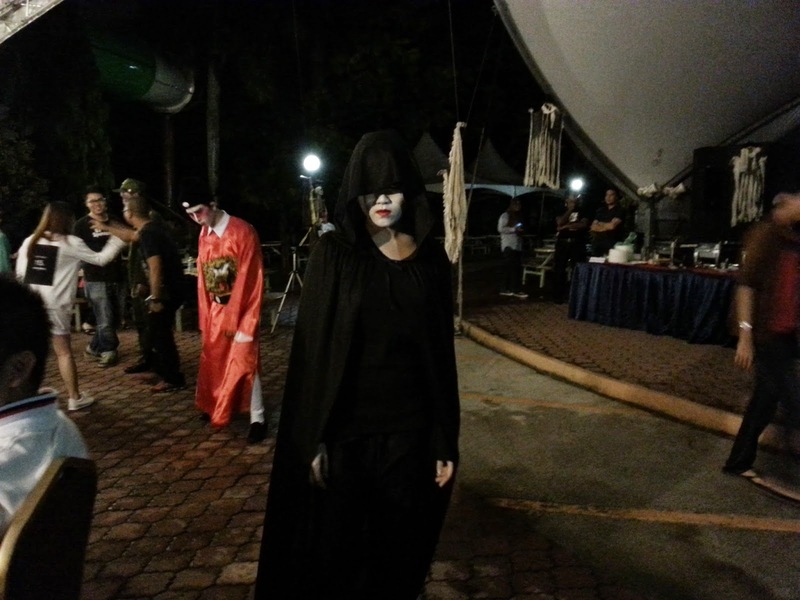 Aside to the challenges, games and eerie decorations that were set up, the Halloween Escape also featured surprise events for the media and bloggers to watch that included live band performances and flash mobs by non other than the creepy halloween mascots. I have to say I thoroughly enjoyed the dance and oddly nice yet eerie music. We also had a quick sit down with the Senior Manager of Wet World Shah Alam, Mr. Steven Chang (Not to be confused with my plus one!) who told us that the concept behind this collaboration with Escape Room came about as they wanted to bring more exposure to what the theme park had to offer in addition to giving everyone a new experience of enjoying Halloween. Of course, the Haunted House is definitely not for those with weak hearts or expectant mothers nor little kids unless accompanied but otherwise, everyone is welcome so long it's the weekends. With a twist of luck did we also get to meet Mr. Victor Lo and Mr. Jason Leung, the handsomely charming founders of Escape Room who then told us that this entire attraction has been built on months and months of pre-planning and they were excited to see how it would workout when they brought Escape Room out of the normal areas. Everything that has been set up at the Halloween Escape has been provided by the folks over at Escape Room and that's saying a lot! "We're just a little twisted and we tend to enjoy getting more people get twisted," said Mr. Lo when Steph and I pondered on the idea of building Escape Room. At this point of time, I do wish that I have more to show you but unfortunately for me, it was extremely difficult to take decent photographs all night as there is something terribly wrong with my phone; throwing itself from a 99% battery life to 47% within an hour...without usage. So I must say that most of the photos in this post have all been taken by Stephanie and also from her blog BLESS HER SOUL. The Halloween Escape at Wet World Shah Alam opens every Friday, Saturday and Sunday in the entire month of October with tickets priced at only RM 38 per person! It's definitely a different experience for those who enjoys a great challenge and if I were to give you an advice, it would be to really go ahead and enjoy yourself there. 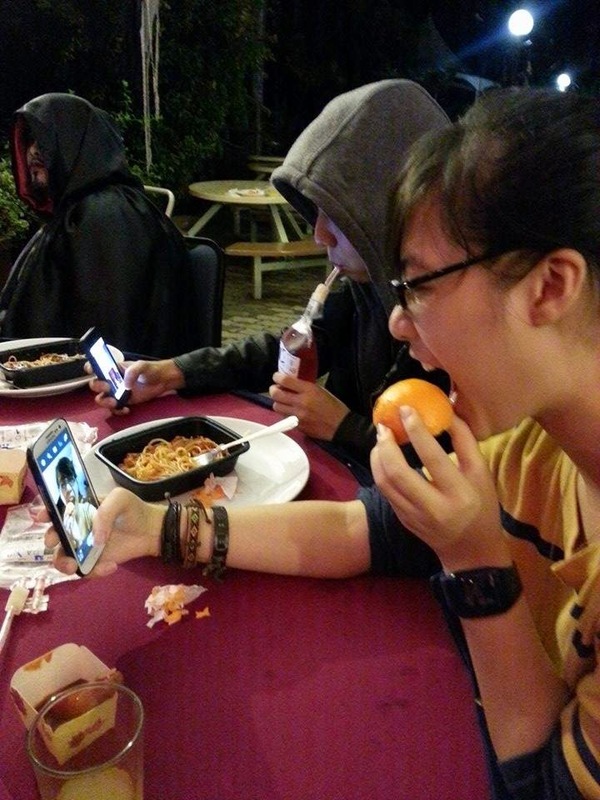 For the hungry ghosts (No pun intended! ), food stalls are set up with likes of food such as fingers with blood and spaghetti with eyeballs in line with the creepy theme. For more details on ticket purchases and other questions, check out the Escape Game page or the Wet World Shah Alam site! Don't be a chicken, go spook yourself crazy this Halloween!